DEVOTEES OF American roots and rockabilly should check out 13 Hours, the latest release from Joe Fury & The Hayride, which is guaranteed to get juke joints jumping, shebeens swinging, and honky-tonks hopping. Eight of the album’s 11 tracks are originals, with guitarist Eddie Walsh having the lion’s share of songwriting credits. ‘No Way of Knowing’ gets things off to a flying start with the ringing twang of Walsh’s guitar and Fury asking “Are you ready boys?” before his bandmates pile in and prove that indeed they are, ready to rock and roll with brio and élan a-plenty, all effortlessly sustained over the album’s 35 minutes. The son of Irish emigrants, Fury founded The Hayride in 2003 after moving back to Ireland, but it was when he met Eddie Walsh that the group really hit its stride. How they met is quite a story in itself. “When I moved here first I had an awful problem trying to find people who could play the music,” Fury recalls. “One November, about eight years ago, I was looking for a guitarist. I spent three hours looking on Google and I found this one advert which was Eddie’s. I rang him at his home in Dublin and we were speaking on the phone for about an hour. He said to me ‘I’d love to do it but I’m just about to move because I’m getting married so I don’t think I’ll be able to.’ I asked him where he was moving to and he answered ‘Castlebar’. I said ‘I’m only 25 minutes from Castlebar.’ He came down every other weekend and said we could meet up the next time he was down. I said ‘I’ll do better than that, I’ll come and see you now!’. I left that evening and drove up to see him. Not long after, Eddie played a gig with us in the Warwick. 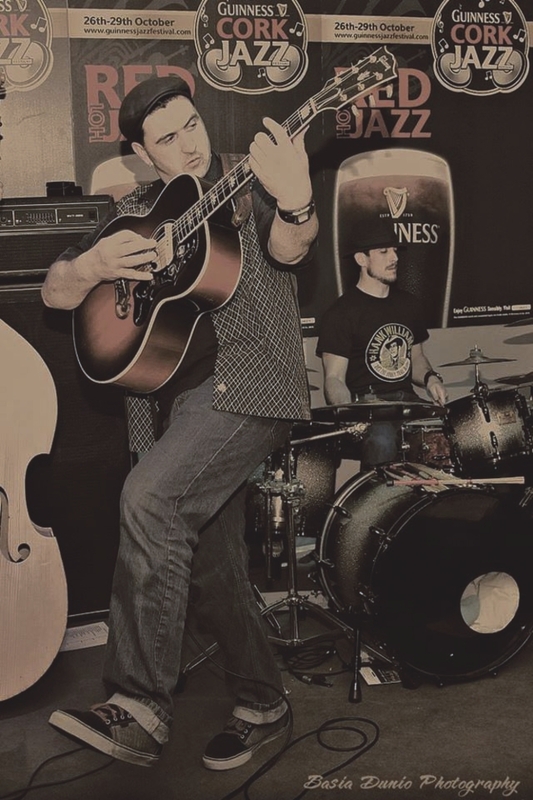 Fury does not define The Hayride as a rockabilly band, pointing out that we “take in all of the genres from that era”, such as r’n’b, blues, swing, country, bluegrass, and “we put them all together”. The album’s title derives from the fact it took the group 13 hours to get all the tracks down and the sound has a wonderful in-your-face immediacy. “I get disappointed when I listen to music, then go to see it live and it’s not the same,” Fury declares. “Everything is over-produced. I always felt that when you listen to music at home that’s what it should sound like when you’re playing live. We were adamant that we were going to record this completely live. When we went into Barn Studios in Thomastown, we went into one room and just hit the record button. Most of the songs we played three times and the vocals were all done in one take. The recording actually took us less than 13 hours because we had breaks for lunch and so on. The album concludes with Fury’s gorgeous solo rendition of the murder ballad ‘Down In The Willow Garden’, which he did as a tribute to the late Phil Everley, the song having been recorded by the Everleys in their prime. 13 Hours is available via www.joefury.com, CDbaby, Itunes, Amazon, and all reputable online stores. Check it out, all you hepcats!